Your help is needed to rebuild Nepal – give a hug, cook a meal, rebuild a home! Damage sustained by the 7.8 magnitude earthquake on April 25, 2015 (and subsequent aftershocks) that destroyed more than 100,000 homes and killed more than 8,000 people. Now there are rebuilding expeditions to four different villages, with itineraries ranging from 14-20 days. The villages are those of affected staff members as well as their neighbors who wouldn’t otherwise be able to rebuild their homes including elderly and disabled people. Each structure will be very personal as you’ll be working side-by-side with local Nepali villagers who are completely invested in bringing their country back up from the rubble. 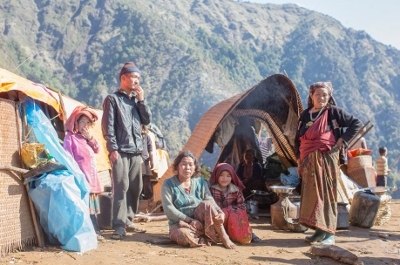 These “VolunTours” will involve trekking to the villages (usually just one day each direction), camping in comfortable tent villages set up by our staff, eating delicious food also prepared by our staff, and participating in a historic rebuilding effort with people of all ages and levels of skill. – Carry rocks, sand, dirt, cement concrete mix. – Make paste (mix of cement, sand and water). – Help with making windows or doors. – Cook meals for staff and other participants. – Teach English/Math/Science/Art at the school. Each participant will be asked to raise at least $500 to assist with rebuilding expenses. Our partner promises that 100% of that money will go directly to purchasing materials needed for the homes! They have ten years of experience building homes and schools in rural regions of Nepal through the 3 Summits for Nepal program, and know what it takes to get this work done effectively and efficiently. You can trust their expertise and commitment. You see, rebuilding homes is only part of the equation of bringing Nepal back to her former glory. It’s important to rebuild hope that was lost when the earth shook, homes and schools collapsed, family members died and lives were ripped apart by the tragedy. These trips are not just about rebuilding homes (although of course that is a big part) but it’s about supporting the Nepali people, sharing a hug or a laugh with someone who’s life has been dramatically interrupted and leaving a lasting mark on the history of that Himalayan nation. Below are the itineraries for rebuilding trips in Nepal. You can book the trip as is or have an expert destination specialist build a customized trip for you. Sign up yourself, friends and your family for a “life transforming” experience. On April 25, 2015 an earthquake measuring 7.8 on the Richter scale struck Nepal. More than 100,000 homes were destroyed. And thousands lost their lives. After the monsoons, the Nepalis will begin to rebuild their homes, and we will be there to help them. At Badel, your help is needed to rebuild the homes of several staff and also those of others who wouldn’t otherwise be able to do it on their own. Participants are encouraged to raise at least $500 to assist in purchasing supplies needed for the rebuilding effort. The journey is 20 days, 19 nights in Nepal with the option to extend and trek onwards to the Everest Base Camp. Departures December through April. At Singla, your help is needed to rebuild the homes of several staff (mainly our female staff) and also those of others who wouldn’t otherwise be able to do it on their own. Participants are encouraged to raise at least $500 to assist in purchasing supplies needed for the rebuilding effort. The journey is 14 days, 13 nights in Nepal with the option to extend on a trek, or another rebuilding trip. Departures in October, November and December. 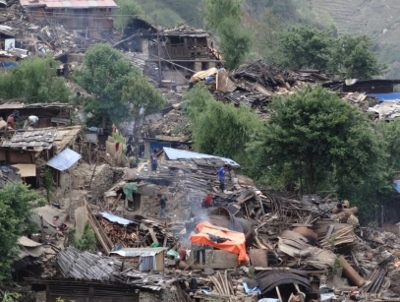 At Bamthi, it was the second earthquake on May 12 measuring 7.3 on the Richter scale that cause widespread damage destroying almost all the houses in the village. Your help is needed to rebuild the home of female guide Kandu Sherpa. After the rebuilding project, trek North towards Lukla on the classic Jiri to Everest Base Camp route. You can either end the trek at Lukla or continue towards Everest Base Camp. Participants are encouraged to raise at least $500 to assist in purchasing supplies needed for the rebuilding effort. The journey is 19 days, 18 nights in Nepal with the option to extend on a trek, or another rebuilding trip. Departures October through April. At Yolung, it was the second earthquake on May 12 measuring 7.3 on the Richter scale that cause widespread damage destroying almost all the houses in the village. Your help is needed to rebuild the home of staff member Pema Sherpa. We will also build Zangmu Sherpa’s house – her husband, the village monk, was performing a ceremony in the local monastery when the earthquake struck. He died trying to help the children escape.